The most difficult kind of tooth loss to cope with is missing all of your natural teeth in either the upper or lower jaw arch or both. Restorations like traditional dentures provide improvements in appearance and function but come with drawbacks that some patients find difficult to tolerate. For patients with total tooth loss, Dr. Gurman provides permanent and sturdy implant dentures for the best in comfort, aesthetics, and oral function. Call or visit Alpine Dental Center today to learn more about your options for stabilized teeth replacements that look and feel great. Permanent, Full Teeth: No Adhesive Required! With minimal to no teeth, everyday oral function becomes more challenging and less comfortable. With the right kind of dental appliances, however, this all changes; biting, chewing, and enjoying better nutrition and all around oral health become possible. Implants used to anchor or permanently retain full arches of dentures are the closest prosthetic to your own teeth. Screw-Retained and Clip-On Lower Dentures – Our Thornton implant dentist is experienced in providing lower dentures supported by implants. Using between 2-6 implant posts as anchors, we can attach a lower denture in a way that does not irritate soft tissue or cause discomfort while eating. Patients can choose from dentures that securely snap onto two implant posts or permanent dentures with six implants that are not removable and act like your own real teeth. 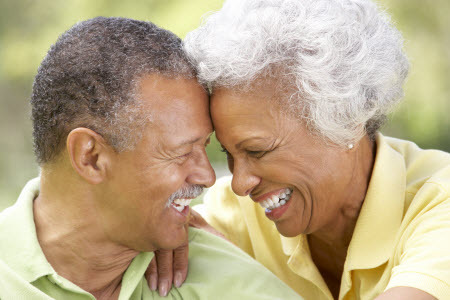 Permanent Upper Dentures – Full sets of traditional upper dentures can be bulky and block the palate, making it hard to taste and enjoy your food, but permanent upper dentures supported by implants provide a significant improvement in comfort and strength, as well as the freedom of an unblocked palate. These permanent dentures use six implant posts as supporting anchors and are long-lasting treatments for total tooth loss. Before beginning treatment, we review important patient considerations, such as practicality, longevity, and budget. If patients have any healthy teeth that can be saved, Dr. Gurman does his best to provide conserv ative care where only severely damaged teeth are extracted and replaced. Alpine Dental Center is also happy to provide implant denture restorations for patients with damaged dental prosthetics. With our flexible options for implant treatment, we are able to provide full smile rehabilitations for patients with any number of missing teeth. Contact our dental office today to learn more about how you can trade in your loose dentures for a comfortable and secure new smile supported by implants.